A basemap is used for locational reference and provides a framework on which users overlay or mash up their operational layers, perform tasks, and visualize geographic information. The basemap serves as a foundation for all subsequent operations and mapping. Basemaps provide the context and a framework for working with information geographically. The Event Editor provides the functionality to add and change basemap layers. In the Contents group, click the Basemap button . 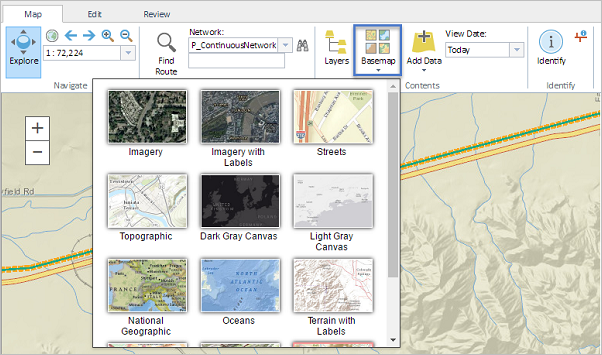 Select any one of the nine basemap layers to add to your map.